The Sports Tutor Soccer Tutor Gold model is a smaller and lighter, battery powered machine which can launch footballs at a steeper angle than the JUGS Soccer Machine but doesn't produce curving shots. The Sports Tutor Soccer Tutor Pro Trainer model is a battery powered machine similar to the Gold model. It has an extendable ball chute which allows 5 balls to be loaded and it automatically feeds each ball. An option remote allows the ball feed to be switched on and off. 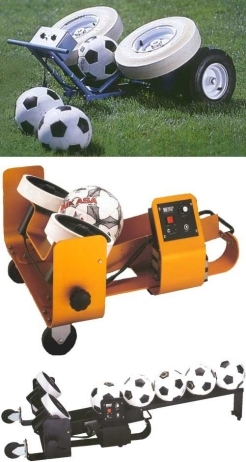 Click on the images to the left for more details about each football machine.